Wednesday, February 15th – We are up at 8:15 a.m. CT (Clifford Time, which is actually 6:15 a.m. in California – just so you know we are not slouches), packed, hooked up, and ready to leave by 11:15 a.m. I say good-bye to our desert home at Cottonwood Springs Campground and we are on our way. 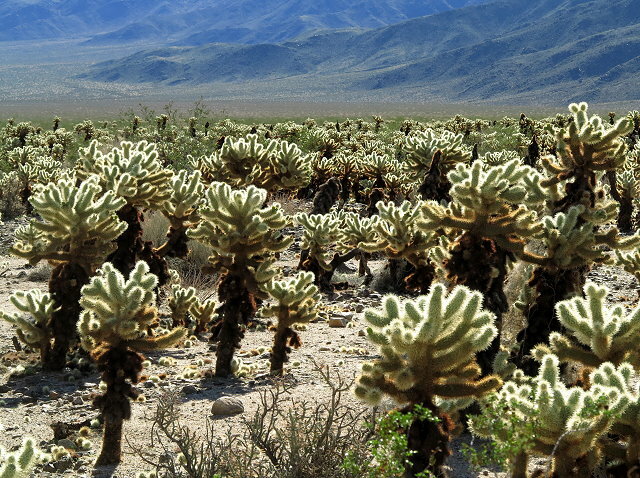 We head north through the Joshua Tree National Park, passing by the Cholla Garden once again, and into new landscapes. 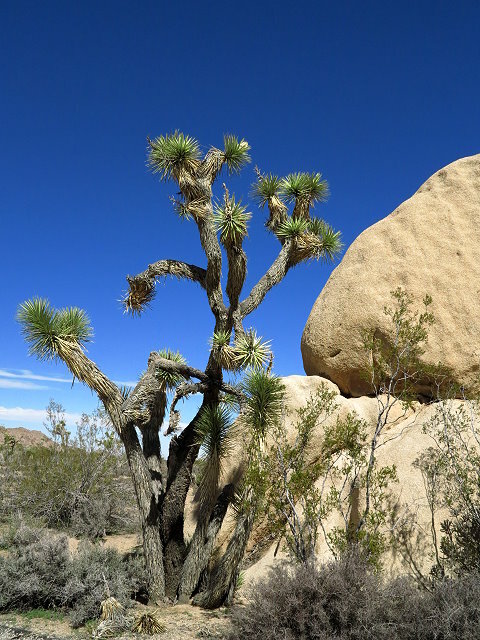 The land becomes even more boulder-strewn and the first Joshua trees appear. Arriving at 29 Palms, we head west to the town of Joshua Tree. 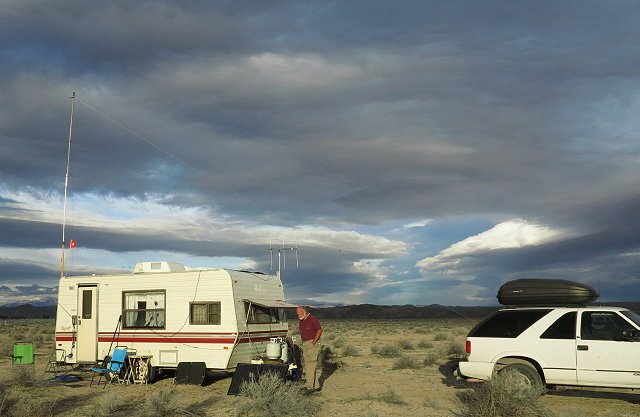 On the north side of town, there is an ancient now-dry lake bed that is a BLM dispersed camping area. Once we arrive, we pull off the rather narrow dirt road to set up camp. It is very barren land and I am not thrilled with it…. so different than the lush desert where we have been the past two week. There is only one type of shrub growing here, something that looks dead, across the entire expanse of desert. Not even any creosote, which seem to grow everywhere in the desert. We get set up and then head to town to check out the post office. Back at camp, I play cello – this is a good place for it – no neighbors near enough to be disturbed by my somewhat rusty playing. We have cell service here, so are able to check email and do texts without having to drive anywhere. So those are the good things about being here. It is interesting that my daughter Becka lived right near here and could look out on this desert from her backyard. Thursday February 16th – Some clouds and a little breeze this morning. Harder to find a place that seems right for a morning quiet-time walk. There is plenty of desert here, but it is not inviting to me. Although not close, there are RV’s in every direction, nothing seems to be alive, and trash everywhere. I pick up trash in ever-widening circles around our campsite, but there are also no dumpsters, so we are stuck with whatever I pick up. 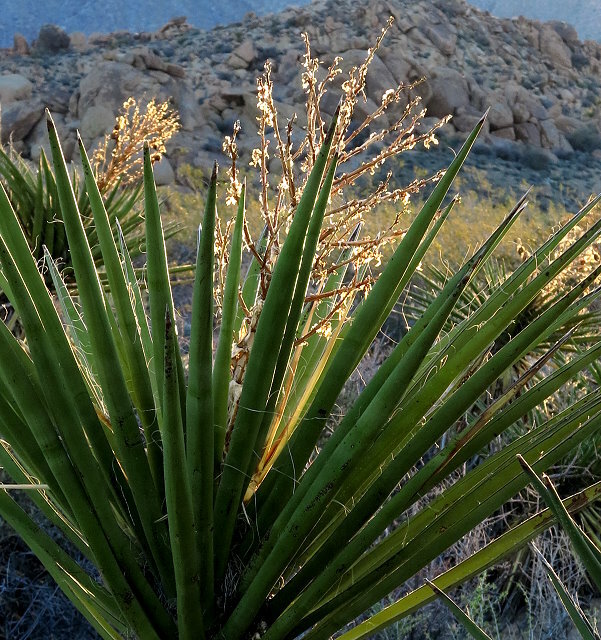 Today we go to Yucca Valley, about 10 or 12 miles from where we are camped, as we need supplies and the town of Joshua Tree is too small for shopping. Back at camp, I play cello a bit. There is a forecast for heavy rain in parts of California, so I put everything that is outside under a tarp. I am a bit uneasy about what I am hearing about this rain, as it could be a lot. However, Clifford is not concerned, so here we are – even though he had to use the come-along to help a couple of fellows get unstuck from the mud just across the basin from us. Hmmm……. Friday, February 17th – It is 31 degrees this morning, cloudy, and very windy. Our campsite in the BLM north of Joshua Tree. Clouds speak of impending rain. A local guy on a 4-wheeler comes by to warn us, and others, about staying if the rain develops as forecast. This dry lake bed will become a bog. He has had the experience of seeing people stuck out here for a month. Well, being stuck for a couple days is one thing, but being stuck for a month is something else. So we pack up and head to the Walmart at Yucca Valley to hang out until the rain passes. This gives us the opportunity to get a bit more shopping done, use a bathroom with flush toilets, and take care of internet business, since cell reception is good here. In the cold and blustery wind, we walk to the Panda Express for dinner, which will save cooking and cleanup in our modified parking lot set up. There is rain in the evening and during the night, along with high winds. I am relieved to be here where we know we will not get stuck in the mud. Saturday, February 18th – Light rain off and on all day. Doesn’t seem like as much rain came in as forecast, but better safe than sorry. Our bathroom is leaking through the light fixture, so obviously there was enough rain and wind to cause a bit of damage and leakage. I do only a limited amount of editing, as we cannot set up our solar panels to charge the laptop while we are here; there is no sunshine, anyway. It is while we are here that our friend Dan in Tucson sends a cell pic of a 1999 Suburban that he thinks we might be interested in. It is for sale for a reasonable price and from talking to the owner, it seems that it has been well taken care of and is in good condition. So, after talking about it, we decide that we will return to Tucson to see and drive it. We have to stay in this area for a few more days to get mail that has been sent general delivery to Joshua Tree. We will move back out to the desert tomorrow, but plans are made to begin the trip back to Tucson.